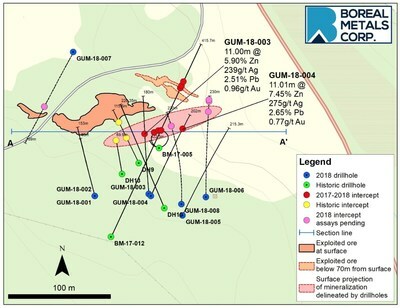 VANCOUVER, Jan. 28, 2019 /CNW/ - Boreal Metals Corp. ("Boreal" or the "Company") (TSXV:BMX) is pleased to report assay results from the first four holes of a recently completed nine hole, 1,620.8 metre diamond drill program at its 100% owned Gumsberg project located in the prolific Bergslagen Mining District in southern Sweden (see Figure 1). "Boreal has made a new discovery of high grade mineralization near the historic Östra Silvberg Mine on our Gumsberg project in Sweden," stated President and CEO Karl Antonius. "Boreal has multiple high grade zinc-silver-lead-gold intercepts in the new South Zone, which remains open at depth and along strike. This is a very exciting development for the Company and is a welcomed reward of our exploration efforts in Sweden." Intercepted previously unidentified mine stope. No Significant Intercepts; geological interpretations suggest that this hole failed to reach the targeted horizon. * Lengths reported as seen in drill core - true widths are estimated to be 50% of reported intervals. In December 2018 and January 2019, Boreal completed nine diamond drill holes in the vicinity of the past producing Östra Silvberg Mine (see Figure 1). Diamond drilling tested prospective stratigraphy east and west of a previously reported intercept from BM-17-005, which returned 10.94 metres of 16.97% zinc, 656.7 g/t silver, 8.52% lead and 0.76 g/t gold south of the main Östra Silvberg mine workings (see Boreal News Release dated February 28, 2018). Drill holes GUM-18-003 and GUM-18-004 were drilled to the east and west of the high grade mineralization identified by Boreal in BM-17-005, and both returned 11.0 metre high grade intercepts containing veinlet, disseminated, semi-massive and massive sulphide mineralization. These intercepts are interpreted to be part of a steeply eastward plunging mineralized body that is spatially separated from the historically defined Östra Silvberg Mine footprint. Drill holes BOL-009, BM-17-005, GUM-18-003 and GUM-18-004 demonstrate over 130 metres of down plunge continuity (see Figure 2). 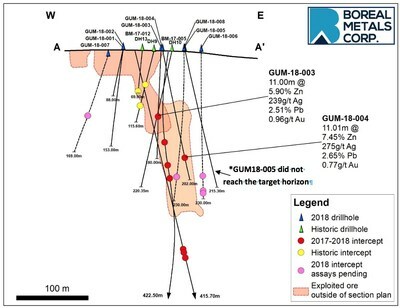 Cosmetically similar zones of disseminated, veinlet, and vein hosted semi-massive and massive sulphides were also cut in step-out holes GUM-18-006 and GUM-18-008, which were drilled below and to the east of the intercepts reported in BM-17-005, GUM-18-003 and GUM-18-004. Analytical results from holes GUM-18-006 and GUM-18-008 are expected in the coming weeks. Together, this group of six drill intercepts constitutes an expanding zone of newly recognized mineralization that remains open to the east and at depth. Daniel MacNeil, P.Geo, a Qualified Person as defined by National Instrument 43-101, has read and approved all technical and scientific information contained in this news release. Mr. MacNeil is Vice President Exploration for Boreal Metals Corp. This news release contains certain statements that may be deemed "forward‐looking statements". Forward‐looking statements are statements that are not historical facts and are generally, but not always, identified by the words "expects", "plans", "anticipates", "believes", "intends", "estimates", "projects", "potential" and similar expressions, or that events or conditions "will", "would", "may", "could" or "should" occur. Although Boreal believes the expectations expressed in such forward‐looking statements are based on reasonable assumptions, such statements are not guarantees of future performance, are subject to risks and uncertainties, and actual results or realities may differ materially from those in the forward‐looking statements. Such material risks and uncertainties include, but are not limited to, Boreal&apos;s ability to raise sufficient capital to fund its obligations under its property option agreements, to maintain its mineral tenures and concessions in good standing, to explore and develop its projects, to repay its debt and for general working capital purposes; changes in economic conditions or financial markets; the ability of Boreal to obtain the necessary permits and consents required to explore, drill and develop the projects and if obtained, to obtain such permits and consents in a timely fashion relative to Boreal plans and business objectives for the projects; the general ability of Boreal to drill test its projects and find mineral resources; if any mineral resources are discovered or acquired, the Company&apos;s ability to monetize any such mineral resources; and changes in environmental and other laws or regulations that could have an impact on the Company&apos;s operations. Forward‐looking statements are based on the reasonable beliefs, estimates and opinions of Boreal management on the date the statements are made. Except as required by law, Boreal undertakes no obligation to update these forward‐looking statements in the event that management&apos;s beliefs, estimates or opinions, or other factors, should change.